I began hosting this project in 1999. An email went out to a news-group I belonged to -- and I received over 120 responses. Since that first email, I have have continued hosting the project each year. Each year, the premise of the project stays the same -- stack cookies (each student gets 2 attempts) as an individual and average the two stacks. 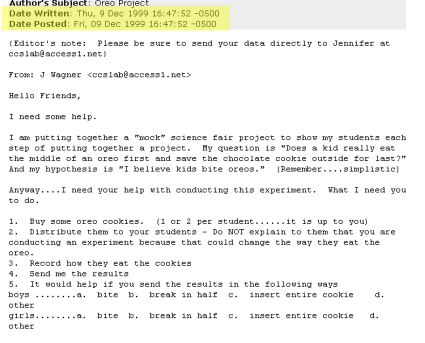 For several years, we hosted a "WHERE'S THE COOKIE" extension idea.